Gimme all the pasta please!! I’m not sure if you guys have noticed or not, but Thursdays seem to be my “bring on the carbs” day. I somehow manage to post things like pizza and pasta on Thursdays. I don’t do it intentionally, but I’m starting to see it as a pattern. I’m pretty sure this is because I am anticipating Friday and the weekend, and I dunno by the time Thursday night rolls around I just needs carbs. I mean, you guys get that, right? So that’s why today we are making pasta. But simple, FAST and delicious pasta. Wait, isn’t all pasta delicious? Kind of thinking that would be a YES. …reason two: burrata. I mean, obviously. 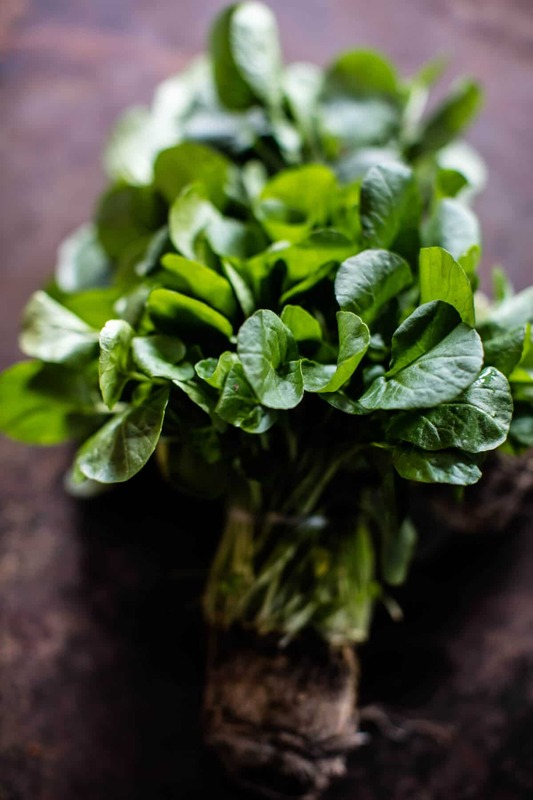 …reason three: fresh spring peas, watercress and basil. All the greens for all the color and all the flavor! …reason four: prosciutto. 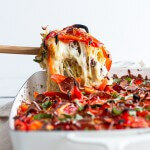 aka the ultimate accompaniment to almost all cheesy Italian dinners. …reason five: it takes maybe twenty-five minutes TOPS from start to finish and you dirty only one pot, one bowl and maybe like a fork or something to stir everything up. Cause on Thursday no one wants to do dishes, and NO one has two hours to make dinner. I get it guys. I get it. This recipe is actually the fancy, veggied up version of this pasta that I made last year. That recipe has become a staple for me and all I did today was create a fresh spring version. You can really use any veggies you love, and or have on hand. I think that artichokes, grilled asparagus, spinach and or kale would all be extra delicious in this pasta. The herbs are really important here as they add the bulk of the flavor….okay and all the parmesan and burrata too. Cheese for protein guys, cheese for protein. ? You can use any cut of pasta you love, but I think a long cut works best. Although, I seem to always favor long cut pasta over short cut when it comes to anything creamy and super cheesy like this. For me, short cut is reserved for dad’s pasta salads and mac and cheese. SIDE NOTE: I’ve mentioned this before, but my family has this group text app going and sometimes some of the weirdest, most bizarre and most inappropriate things are said/shared. I will not share the inappropriate, because well they are just BAD and my family is insane, but I just got a slew of message on our family “group me” that all started with my oldest brother informing us that he has accidentally eaten part of a plastic fork while eating boneless wings. The string of texts that followed are both hilarious and totally Gerard family. Also, I promise my brother is not that odd, he just eats too fast and gets way too excited about wings…okay, he might be a little weirder and odder than most. ? Anyway, the point in this most random sidenote ever, is that these string of texts cracked a huge smile on my face and ended my night in a good way…cause I am currently tired, starving and totally in need of a shower. It’s super late at night as I type this and I really need some FOOD in me… like now, and I still need to go find Snape who is outside lovin life and probably will not come when I call him…UGH. 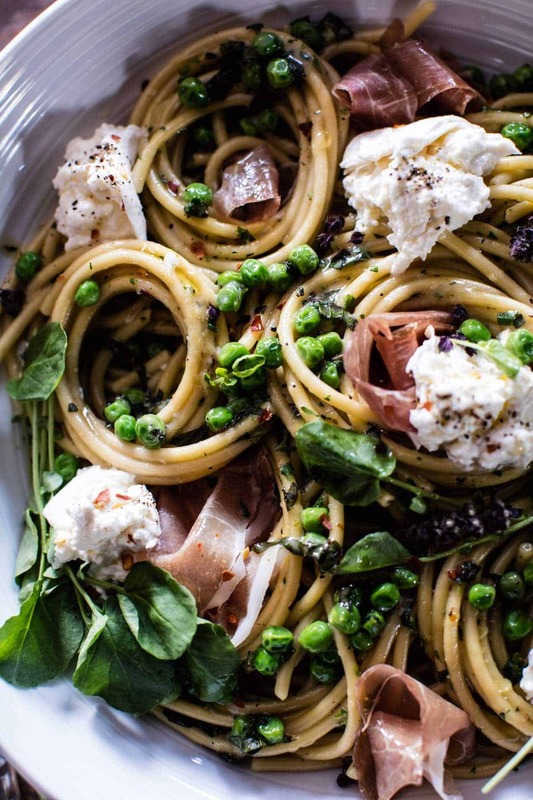 Side note over, now lets all have a KILLER Thursday and make this yummy Spring Pea and Burrata Pasta !!! 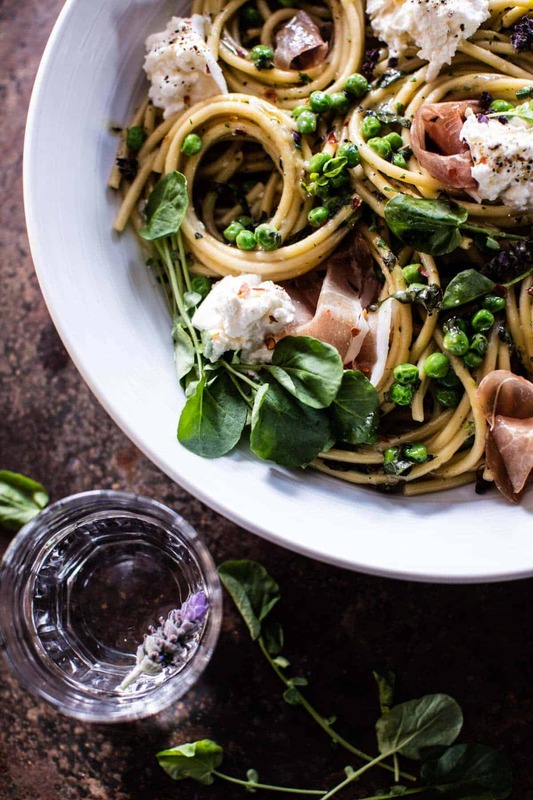 Simple Buttery Spring Pea Pasta with Prosciutto. Simple, FAST and delicious pasta. Bring a large pot of salted water to boil. Boil the pasta until al dente. Meanwhile, whisk the eggs together in a bowl. Add the parsley, basil, parmesan and a pinch of both salt and pepper, whisk well. If desired add a pinch of crushed red pepper flakes. When the pasta is ready, drain and add the hot pasta right back into the hot pot. Working quickly, add the egg mixture to the hot pasta and immediately begin tossing the pasta. Continue to toss the pasta for 2-3 minutes or until the eggs have cooked and formed a creamy sauce. Add the butter + peas and toss once more. Taste and season with salt and pepper. Add the prosciutto and burrata. 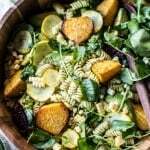 Divide the pasta among plates or bowls and top with watercress and poached eggs. Drizzle the burrata lightly with olive oil, salt + pepper. Enjoy immediately. I’m basically a sucker for pasta, though I try not to overdo it, by not eating it very oftenly. This one looks so refreshing and Spring like, I would love to dive into that bowl. Thanks Miranda! By all means!! Dive in! That’s hilarious about the plastic fork (even though I hope he’s okay), and I am SO all for this pasta! You really can crank out the best easy meals Tieghan! Btw, it sounds like your working too hard, Girl! Make sure to take a few minutes to take care of yourself and just breathe. Thanks for all the time you put into sharing such amazingness! me- where is the stick? thank goodness it was the paper type of lolli pop stick. could not find trace of it anywhere, so i think he ate it! …its not just your family. lol. HAHA thats so funny! Only difference is my brother is 30!! I don’t eat pasta ( I know, so weird) and always so indifferent to the pictures… but this one is just calling to me, it looks sooo good! Maybe it’s a Thursday thing, I agree 🙂 I think I will have to break the tradition.. I hope you find it!! I think you’ll love it! I read a stat that said people are in their very best mood on Thursdays, so if you have to ask a favor, ask then! Maybe this is because they know pasta is coming? Anyhow, I love the springiness of this dish. So fresh and delightful. Thats interesting!! Thank you for the kind words!!? 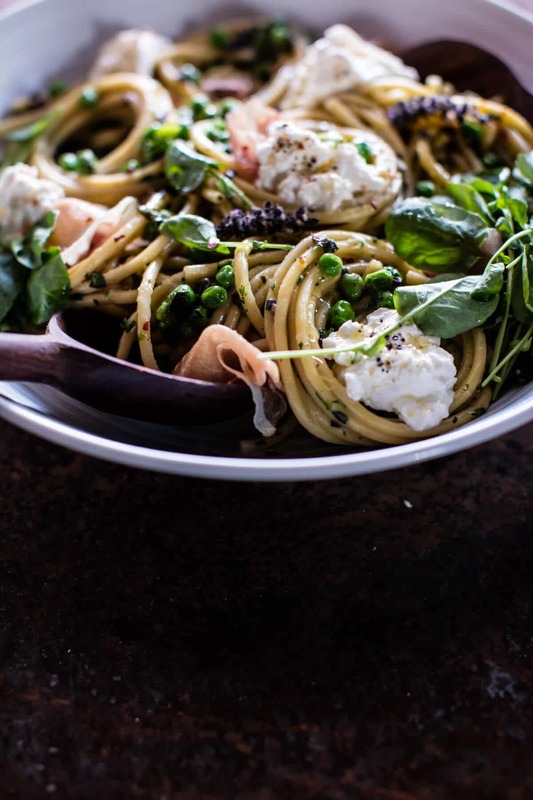 One of our favorite easy pastas is with peas and feta but burratta might just beat feta in this case! This looks divine! My family has a whatsapp group too, and it’s priceless. We’re so lucky to have such an instant way to keep up with one another – even if it is just an update on eating a prong from a plastic fork! 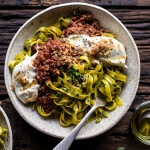 Love the look of that pasta, I shall have to track down some burrata asap. It is pretty convenient!! Just so everyones clear… i got an update, it was a bit more than a prong… more like half the for lol! Ok you know my routine have to sub for the cheese.. ( 3 H drive to the store). Don’t have feta on hand either.. Any suggestions. ? 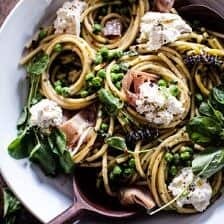 Looks divine.. Peas Pasta..awwwww spring..and guess what SNOW in the forecast.. so a comfort bowl of goodness is in order. thanks. LOVE this! I love doing prosciutto in pasta. Thanks for sharing. Thursday/Carb Day. I think that should be a thing, and now I’m going to celebrate it with a big bowl of this pasta. I love how spring-y and fresh it is! Im into it!! haha its funny the happiness that comes from the family chats!! also, super impressed with how you styled this bucatini! I’ve photographed with it for a few clients and it’s SO hard to get to look nicely, I’m assuming you used a giant fork to get those even twirls – nicely done chica. I did! It took a few trys!! But thank you Christine!! Pretty much every day for me is Peanut Butter and Sweet Potato Day. I mean, don’t judge, right? 😉 I am always so awestruck by how you plate the food and edit your photos! So gorgeous and high quality–really captures the essence of your culinary artwork! Thank you so much Cassie!! Im super picky about it!! My inner perfectionist comes out for sure. 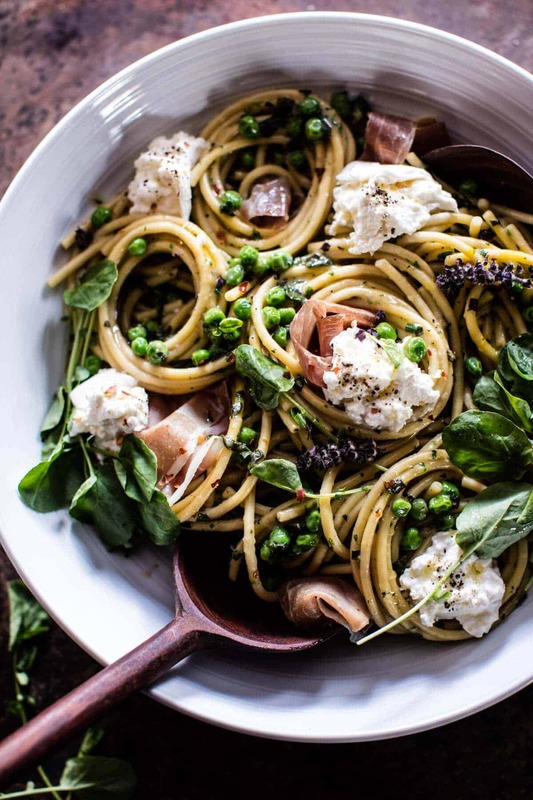 Love the spring flavors in this pasta… and of course, burrata makes everything amazing! Love it Tieghan! 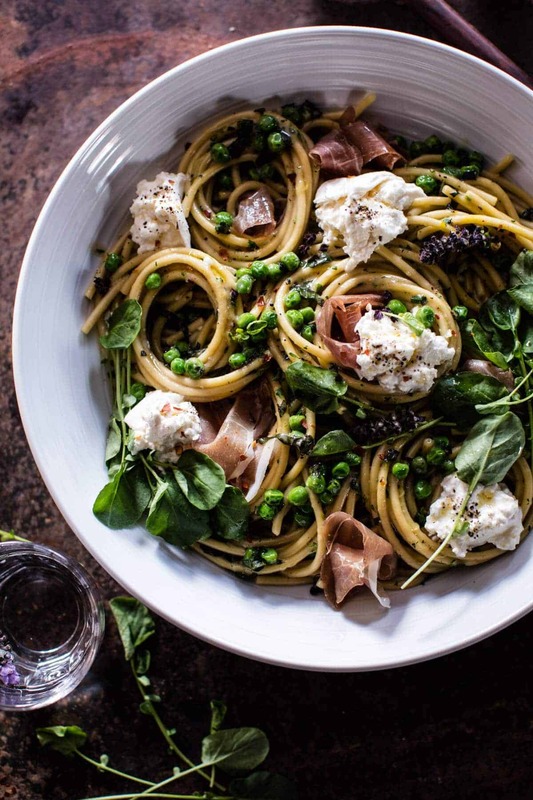 Can we please eat pasta and burrata every day?! Yum! 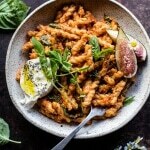 This looks so fresh and inviting and I love how you’ve styled the pasta 🙂 I adore pasta and probably eat far too much of it but it is sooo goood, especially when there’s lots of cheese…. I’m always a fan of pasta with peas in it! I cannot wait to make this for my husband Tom! It’s going to be a hit! Spring peas with prosciutto is one of the best combos ever. I am loving this pasta! I love your pasta dishes. Your brother is ok isn’t he?? Thank you!! He is okay… so far! The recipe sounds great too 🙂 Somehow I’ve never heard of this egg sauce nor have I had peas in pasta. Thanks for expanding our horizons yet again. Made this for dinner last night. So delicious. Mine even looked almost as good as your gorgeous pictures. The only change I made was that I browned the butter. Awesome! Also, in case anyone else wants to add the poached eggs as the piece de resistance but is as intimidated as I was…. Good luck with the book deadline. I love the simple recipes that are coming out because of your schedule, but I hope you’re holding up okay! Made it, loved it. We called it “spring carbonara” – its absolutely spring in a dish. I used fresh peas (a lot of work but totally worth it in this dish!! ), arugula micro-greens in place of the watercress (no watercress at the grocery today) and added a squeeze of lemon – so so soooooo good. The hubs also adored it. Win-win! Will definitely make again. I made this for dinner a couple days ago. Sooo yummy! I was kind of wary when I saw the peas but they were delicious mixed fresh into the pasta. The whole family loved it. Thanks Tieghan! AHH! So awesome to hear! Love when my food pleases an entire family! (can be hard to do!! Especially in my family!!) Thanks Katie! Yes, that would be delish! delicious! A complete hit with the ladies at bookclub. I made small modifications to suit. This showstopper will be on my regular repertoire for dinner parties and the like. I am so glad you all enjoyed this pasta Jennifer! Thank you so much!